I featured Yael Falk's wonderful and unique wire work jewelry designs some 3 years ago. This Israeli designer (Yoola Design) is so innovative that I had a hard time back then describing her fantastic technique. Is it wire crochet or knitting? Yael calls it the ISK (invisible spool knitting) wire crochet technique. She uses special small looms and tiny hooks to create flat as well as 3D designs all of which are finely executed. Some of my favorite designs from her collection are her earrings. 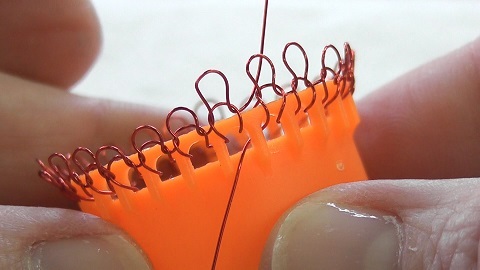 If you've tried wire crochet before, you'll know it is hard to get even stitches. Yoola's looms makes this possible. 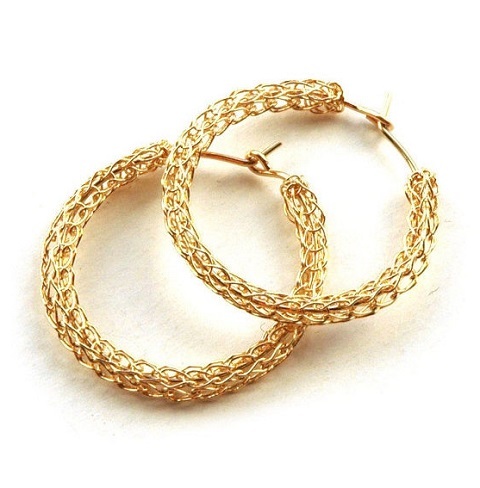 The hoop earrings below resemble Viking knit but was created differently and I suspect faster too. 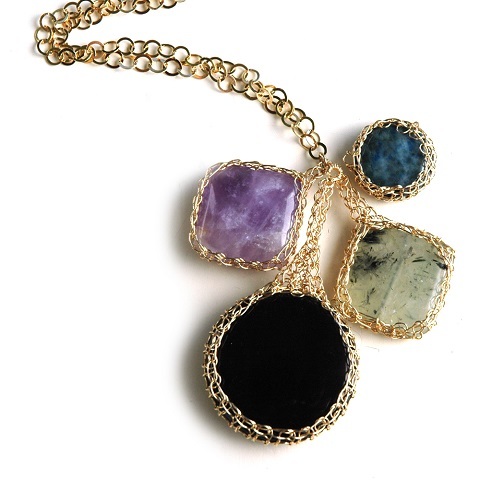 Isn't the Cleopatra collar necklace spectacular? The jewelry set is just as stunning plain or embellished further with focal beads etc. Her hybrid technique can also be used for bezels. 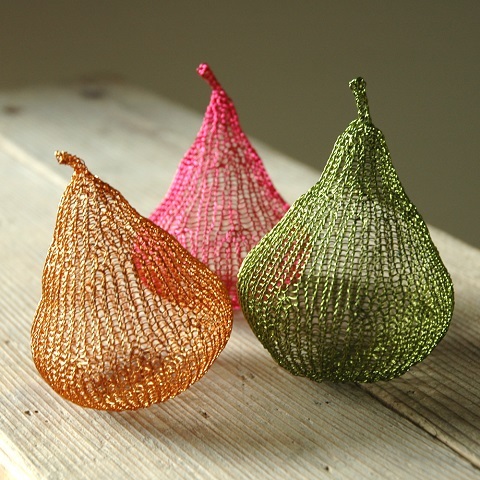 Or even as home decor items like these pears! Check out her lampshades too! Yoola has worked hard and grown her brand so much so she now offers not just her jewelry designs but also the tools, tutorials and patterns (both pdfs and videos) for those interested in learning her technique. She has a wide variation of kits and supplies. I recently bought the fine crochet hooks and this starter kit myself! Note she is also on Etsy. Yael also gives workshops in Europe. Check out her workshop schedule on her website. Also watch this great interview. Non-Israelis may not understand the language but the 2-minute video shows one of her workshop classes in session. One lucky winner of this giveaway will win Yael's wonderful sunflower tutorial kit! This is worth $59. If you'd like to be that winner, then have a go at winning the above Yoola Design kit, please make a comment below. Make sure you leave contact info if you do not have an online shop or blog. Please also share which other kits or patterns might be your favorite in the comments. It ends in a week's time at 6 pm EST Monday, July 21, 2014 . I will pick the winner randomly and announce the results as soon as possible after. So be sure to leave a contact email if you don't have an online link or make sure you come back and check! Otherwise I will redraw in a week. Good luck! wow, this is so beautiful. I would like to win the kit. What a unique way to wire crochet! Having tried the 'traditional' way, this technique seems so easy. I love the home decor options too. She does awesome work!!! I'm totally in love with the bracelet cuffs she makes!!!! I've been wanting to get into the wire work a bit more, what an opportunity!! Now this is a kit I'd LOVE to win. Great giveaway. Thank you! Beautiful craftsmanship!!! I'm not sure I could measure up, but would love to try!!! Thanks Pearl for another great giveaway!! this is really an improvement on my" crochet" efforts. I would love to win this kit. thank you so much for giving us so many ideas. 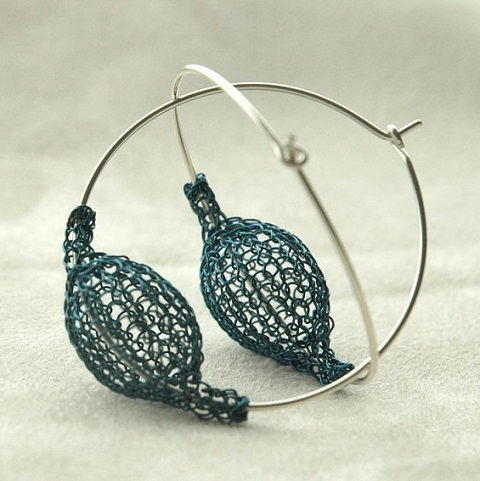 I love the look of wire crochet & have made many items using various sizes of hooks. I have wanted to try the knit kits since I first saw them; I believe they would enable me to expand my designs. Yoola's Designs are inspiring. I would love to win this kit, I love to crochet with wire. Wow, I didn't know about this technique. I really like the first necklace. I would love to try it ! Such lovely colored wire! My fingers ached to run across the smooth even surface! I have been a follower of Yoola for a long time on Etsy. I love her work and her wire colors. I would love to win this kit to give it a try. I also love her lamp shade kit and the pear kit. I am interested in wire work and would like to try it. I would love to start something new, my muse is on strike. This looks like a lot of fun, would love to have the kit, and to learn how to do this. This is the first time I have seen this type of wire work--it's just beautiful. I would LOVE to win this kit to find out how it is done. These designs are incredible. I especially like the hoop earrings. Omigosh!! I am in love! These are so amazing. If I had to choose favorites other than the sunflower, I'd pick both the infinity set & the cuff bracelets, but I would not want to limit myself. Learning this looks like so much fun. BTW, I'm a blog subscriber. I've admired Yael's work for a long time and her tool looks like a great way to get started. I love the spiral earrings, they look so delicate and hang nicely. Thank you for yet another awesome giveaway. I am a blog and newsletter subscriber. I've been a Yoola fan for years; I've always loved her cuffs. Now I like her newer pendants, too. I follow by email and on FB and never miss a post. Pearl you have down it again! Another fabulous giveaway! I love this! I am a blog subscriber, avid fan of yours and would love to win this! Beautiful! I love the flat spiral earrings! I've only recently started learning to crochet but I'm fascinated by the number of different patterns you can produce with one little hook! Tried the traditional way with my own template of wood and nails, not sure where the recalcitrant thing went but this one I would NOT lose, it really works, lol! Love all the pieces made with this technique, really want to try the cabochon frames and lampshades! Blog subscriber, posted to Facebook and Pinterest. Thank you for the opportunity!! I would LOVE this kit or her etsy shop OVAL RING kit would be wonderful too! Go ahead and put my name in again Pearl - I'll give it a try! I have done some wire crocheting but nothing like this. I would love to win the kit. Wow, this wire crochet knit is fantastic. I love wire crocheting but on the loom is probably easier and more fun. So happy to find this e-mail. Thanks so much for advertisement. Hope to win this amazing little tool. Blessings to you all for all you do to keep beading always an excitement in the art world. Oh, I would love to win this Wire Crochet Knit Kit--I've struggled to learn to wire crochet recently, and as a left-handed gal, it's a HUGE challenge--this may be just the help I need for success! Since I couldn't win anything if there was only two people entered, you piqued my interest in Yael's method enough that I put an order in myself. Now, I just need to win the time to try it! Your blog is becoming very expensive, Pearl. Oh My! This looks amazing. I subscribed to your blog. I really like what I've seen so far. Thank you for the giveaway, I'd love to learn wire crochet this way, it's been too inconsistent for me in the past. This is a fantastic giveaway! I have admired Yoola's designs from afar. You got me at the "If you've tried wire crochet before, you'll know it is hard to get even stitches." My fingers are so crossed for this giveaway. Thanks for the chance to win. Looks wonderful - would love to win! I love jewelry making, new ideas and crocheting, so this would be the perfect new skill to learn for me. I would be so happy to win this kit, but am not holding my breath. I'm sure others would love it as well. Thanks for offering it up to be won. I love to win this kit. 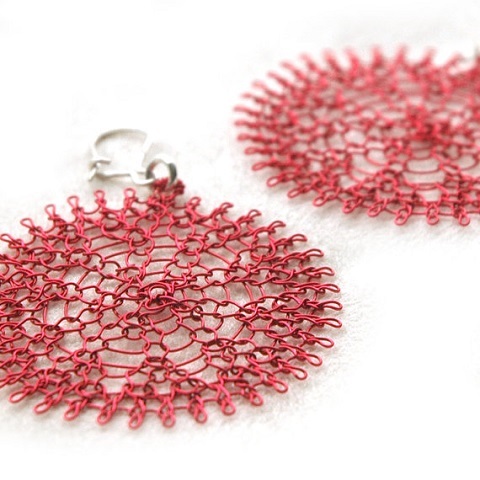 I crochet some jewelry wire but want to try this method, is so beautiful. Lovely work. I have not seen her wire jewelry before. Thank you for the chance to win. I've been dying to try her method out! Love her stuff. 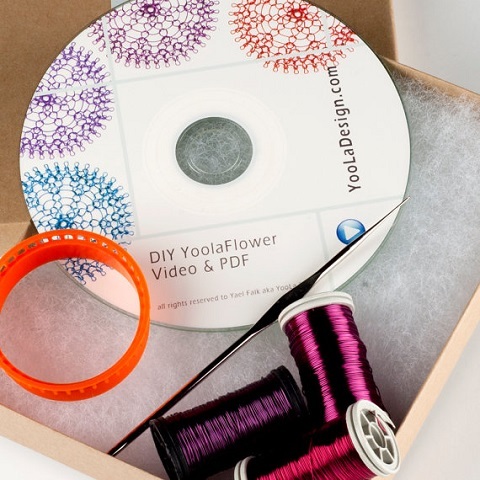 Yoola is such a talented artist and how creative and generous she is as to share her creative designs by designing a beginners kit with tools AND tutorials!! I so hope I win one of her kits but I would definitely order another one of her kits as well!!. By the way, I wish I spoke Hebrew so I would know what was being said in the video! This is something I'd really like to learn. Would love to win this. It's so hard to decide. I think my favorite is the infinity necklace so I would be looking at that tutorial/kit. The pendant lampshades are also gorgeous. This looks so fun. I'd love to win this. Just tweeted about your post, her work and the giveaway. Thanks Pearl for giving me the stage and presenting me to your readers , I'm honored to have been spotted by you ! I have been looking for crochet class on the internet. The first website caught my eyes is Yoola's. I hope to win the kit if I Can choose. I am your blog subscriber. I would love to win a kit. I can't decide which one is my favorite!! I have tried Viking knit before but this technique looks much easier and creates a much more finished piece. Would be thrilled to win this!! I've been wanting to try out the earrings and the bezels. I'm a blog subscriber and facebook too. I remember your old feature post on yoola's post,and how I fell in love with wire crochet. infact her jewelry was one of the first few images I ever pinned on to pinterest. Cleopatra Gold necklace wire crochet jewelry Royal statement necklace high fashion jewelry glamorous necklace is my favorite! I follow on you Pinterest under name Mai Tran. WOW, what a great idea. I love unique jewelry and this kit realy makes it easy to create your own. Would love to be the lucky one who wins. P.S. : great website, I realy love your tutorials, reviews etc. Thanks for the brilliant work you do. Mi piacerebbe imparare a fare questi bei gioielli! 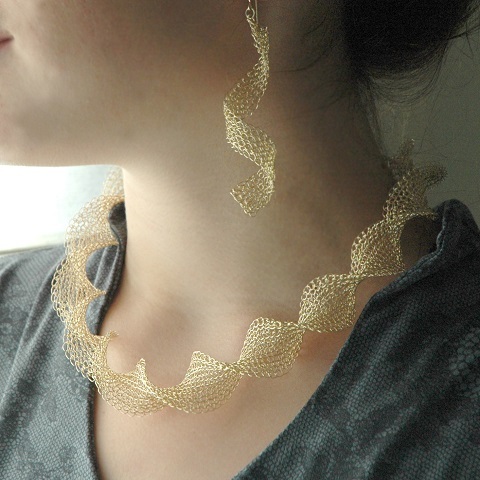 I've been very curious about crochet jewelry and up pops the perfect contest! I love your blog and all of the inspiring tutorials. Thank you for offering us all a chance to win a special prize too. Crochet is my passion and love it,but never try it with wire before.Thank you for the chance to win it,amazing giveaway.Infinite necklace is lovely as everything else.Have a great weekend. ooh I've been watching her for a while. All of her work is beautiful! Would love to try this out! love the earings and the necklace!! Both my daughter and granddaughter love to make creative jewelry pieces, this would be so perfect for them to share. This wire work is wonderful. I love the pears. I'd like to be able to make bezels. Endless possibilities. Wow! I've never seen this type of jewelry before. It's beautiful. *_* I would like to learn how make them. This is awesome stuff! I'm from India and your stuff is so unique! I'm a budding jewellery designer and would love a kit to get started!! I'm going to start following your blog and on pinterest and facebook. Thanks a ton! I would love to have this. I'll be giving it as a present to my girlfriend on her birthday next month. That is really gorgeous and so unique! I'd love to try it. 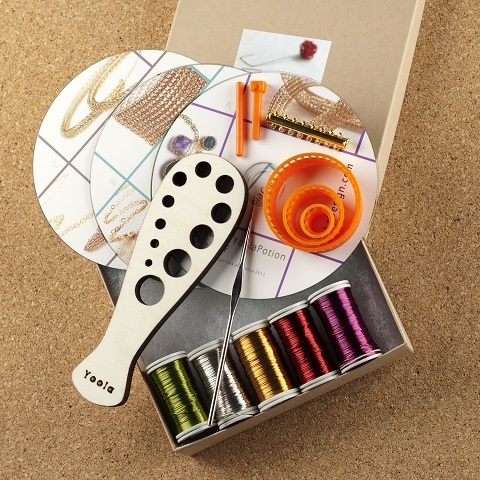 Looks like another great craft tool to try!! I would appreciate winning the kit for sure! Thank you. Wow, it is all so beautiful; so inspiring! This is really different. I would just love to win this kit. I have to have it! !